In Harmony tapestry we see a group of ladies enjoying the day with music making. From a tradition in the 17th to 18th where the aristocracy were portrayed in a natural setting of gardens, in this case, the garden outside their estate, the emphasis is on the role of nature as much as the figures themselves. 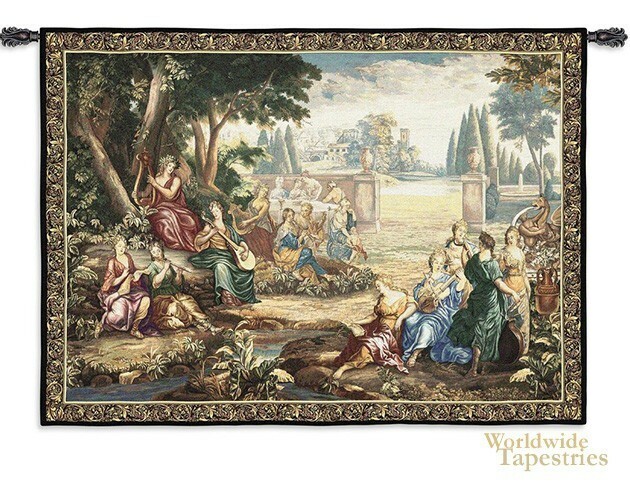 The lutes and flutes as well as harps were used to create music to sing to, and the composition itself with its balance of trees, foliage, with subjects and background objects makes this tapestry a harmonious work of art in its own right. "Harmony" tapestry is backed with a lining and comes complete with a tunnel for easy hanging. Note: tapestry rod and tassels, where pictured, are not included in the price.